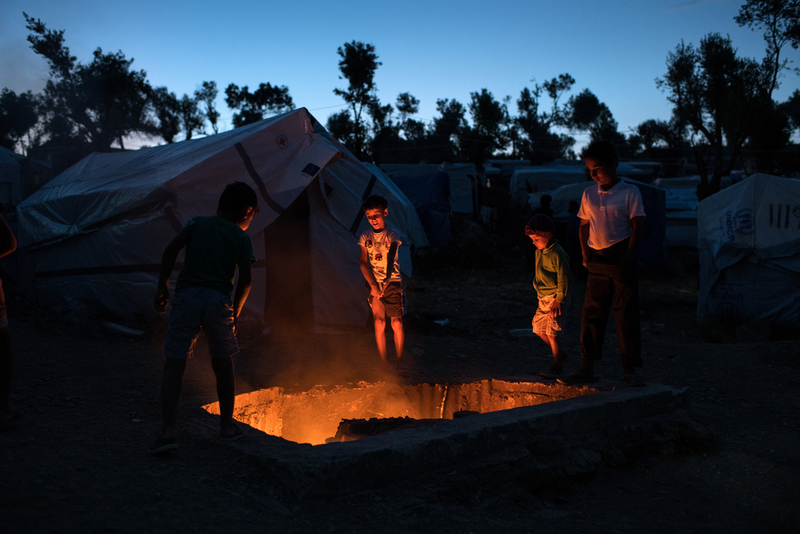 Having fled war, persecution and hardship, thousands of people are now stuck in squalid camps in Greece, unable to leave or to rebuild their lives. 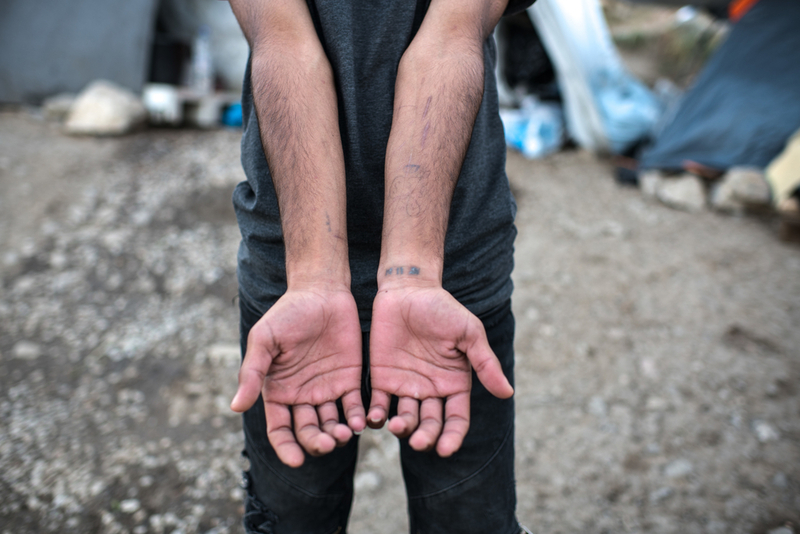 In Moria, on the Greek island of Lesvos, mental health needs are now so widespread that only the most severely unwell patients can access care. 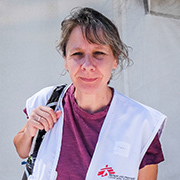 Liz Clark, a family doctor from the UK, shares her experience from Moria. My summer on a Greek island began at the end of May 2018. However, Lesvos is one of the main arrival points for people fleeing conflict, extreme hardship and persecution. It is the back door into Europe, but the door is firmly closed following the EU-Turkey statement forged in March 2016. "The EU-Turkey deal claims to be protecting migrants and refugees from putting their lives at risk attempting the journey to Europe, but it has not stemmed the flow of people who have so few choices of where to go." This so-called “EU-Turkey deal” is aimed at stemming arrivals of migrants and refugees from Turkey to Europe by allowing them to be forcibly returned to Turkey or by forcing them to have their asylum claims processed on one of five “Hotspot” islands, of which Lesvos is the biggest. During this time, they are not allowed to leave the islands unless found to be “vulnerable” as defined by Greek law. 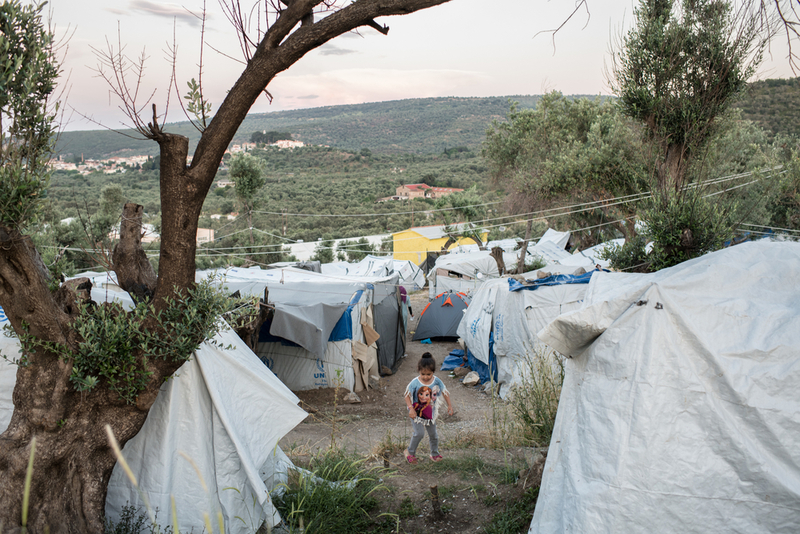 The majority of migrants “contained” on Lesvos live in Moria camp, which lies in olive tree-covered hills a fifteen-minute drive from town. However, Moria camp does nothing to hide its origins as a former military base and is surrounded by high metal fencing topped with coils of razor-barbed-wire. Originally constructed for 2,500 people, with capacity then increased to 3,100, Moria is now overflowing with over 9,000 people who can remain here for months and even years awaiting the long processing of their asylum claims. 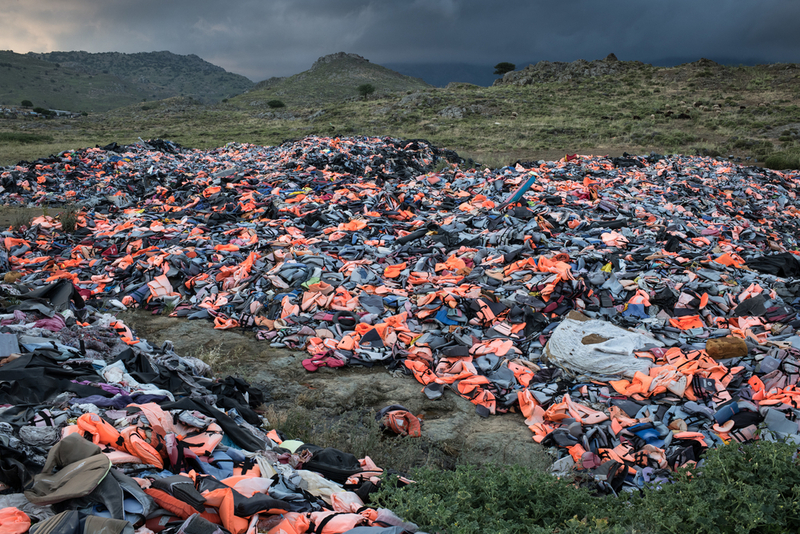 Thousands of life jackets left behind by arriving migrants are gathered at a dump on Lesbos Island, Greece. 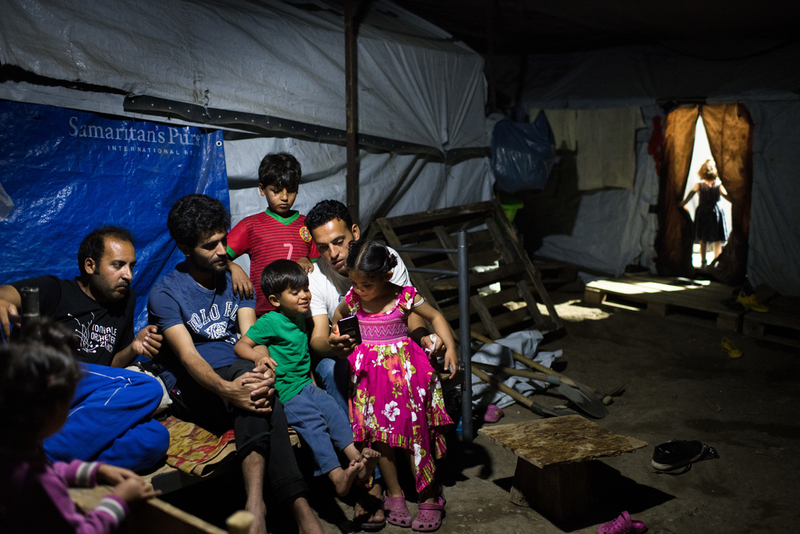 The EU-Turkey deal claims to be protecting migrants and refugees from putting their lives at risk attempting the journey to Europe, but it has not stemmed the flow of people who have so few choices of where to go. The overcrowding, inhumane living conditions, limited access to health services, exposure to violence and lack of protection within the camp all contribute to the misery of those living here. It is difficult to believe that this is Europe, where the European Convention on Human Rights came into force in 1953. Everywhere migrants live in tightly packed iso-boxes – shipping containers converted into tiny living spaces - and UNHCR-material-clad tents. Large tarpaulin structures also known as “Rubb halls” each house over 100 people, whose only privacy is provided by grey blankets used as screens (one with “Ambassade du Congo R.D.C.” scrawled on the outside). Elsewhere, smaller tents line the walkways and fill any gaps between other structures. Through a gap in the perimeter fence, there is an ever-expanding overspill area called “Olive Grove”, with more haphazard makeshift tents and remnants of cooking fires on irregular terraces. Recent drone-footage shows this is now bigger than Moria camp itself. With Moria camp so full, refugees are now staying in an informal extension of the camp known as "Olive Grove". Throughout the camp, there are converted shipping containers housing MSF-installed toilet and shower blocks. However, according to recent figures there are between 62-70 people for every toilet and 84 people for every shower in the main part of the camp and the Olive Grove. This is respectively twice and three times more than the international minimum standards in a humanitarian emergency. There are several long, narrow rows of metal fencing which people must enter to join the lines for food. Each is filled with men who must wait up to three hours to collect their daily food supply. People also crowd around the fortified enclosure where they have to come for their long-awaited asylum interviews and maybe the next decision which will determine where they go from here. Then there is the detention facility for those who, because of their country of origin or because their asylum appeals have failed, are deemed “inadmissible” to the EU, and who face being returned to Turkey or even the countries they have fled in the first place. 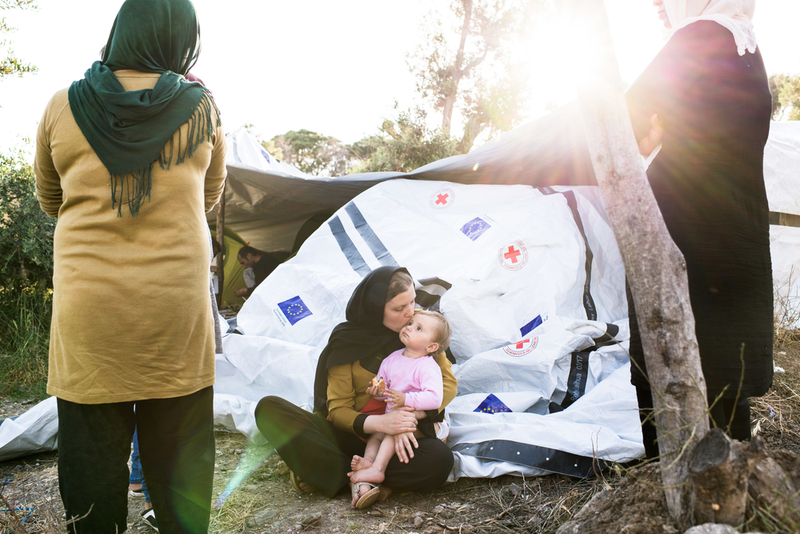 Access to the Greek-designated provider of healthcare in the camp is limited. Those seeking medical treatment have to provide an appointment slip, or somehow prove their need to see a healthcare provider to the police officers that control entry to the enclosure where the clinic is situated. "I am overwhelmed by the severity of each referral that arrives in my inbox… Histories of imprisonment, torture, loss or the disappearance of multiple family members are common." Their clinic is in another converted container. It has two rooms cluttered with desks, people and equipment. On my last visit to speak to the man who is in charge, we knocked over a can of Coke on the fridge as there was so little room to manoeuvre and we were separated only by a screen from the patient lying on a trolley just behind us. There is effectively only one doctor working in the clinic, so it is left to MSF and a diminishing number of small NGOs to try to provide basic medical care for people living in the camp. All NGOs report that mental health problems dominate among those that do get to see their nurses or doctors. The smaller organisations are staffed by volunteers who often come for just a few weeks at a time. There is little capacity to manage patients who are especially vulnerable or whose condition requires more than a brief assessment to decide what is wrong with them. Our multidisciplinary MSF team receives referrals from the other NGOs working inside Moria, but we are only able to accept those patients who have persistent psychotic symptoms, who have attempted suicide, or who demonstrate significant self-neglect and inability to function. “Doesn’t speak”, “never sleeps”, “has to be helped to eat and wash”, “screams whole night”, “runs away”, “sleeps in the forest”, “shaking with fear”, “does not recognise friends”, “muttering”, “no eye contact”, “so restless has to be tied down”, “voices tell him to kill himself every night”, “tried to hang himself and friends cut rope”. Patients sit at the plastic tables in our ground floor waiting area looking lost and defeated. There is little conversation or activity, some sleep head-on-crossed-arms or half-lying on the sofa under the painted MSF logo on the side wall. A Kurdish man shows his injuries. His family of seven fled Syria after the bombing of their city. They have often reached the clinic only because a “friend” has brought them here. Their “friend” is usually the person who sleeps next to them in their container or tent – who is tired of hearing them scream at night, who makes them eat and wash, who watches over them to stop them harming themselves and who ends up bringing them several times a day or week to be reviewed and given their medication. I follow one patient up the clinic stairs as he clutches at his trousers to stop them falling down… his neighbours have taken the belt which he used to try to hang himself. One advantage of Moria being so overcrowded is there is always someone around to remove the rope or knife from the hand of a person whose hopelessness has become unbearable and who wants to end their life. Some patients barely communicate, some are tense and fearful, while others react to the voices they hear and the things they see that are not there. Some patients dissociate during a session with the doctor and are suddenly unaware of their current surroundings, behaving as if they are back experiencing their torture or ill-treatment. One patient’s prolonged dissociative episode on a Friday lasted for several hours. He was wide-eyed and staring around the room, fists clenched by his side, suddenly standing to attention and saluting, hitting the wall behind him and muttering something to the person or people he perceived to be there. "An Afghani woman tensed at every small noise and interruption while she told me of her constant nightmares, flashbacks and fearfulness since she was tortured and raped 'a thousand times' in front of her child by Taliban men." Despite constant reassurances that he was safe and in the MSF clinic, he had a fluctuating minimal awareness of our presence. He kept smelling at a tube of ointment which was the only thing that seemed to help restore his sense of reality and allow him to be back present with us. He was eventually persuaded to take a couple of pills and he slept. After waking him at the end of the afternoon we sent him back with a few more pills, crossed-fingers hoping he would survive in Moria over the weekend. He should have been sent to the local hospital to be admitted and observed closely, but any residents of the camp seen by the local psychiatrist are diagnosed as having “a problem due to lifestyle”. There is effectively no access to in-patient psychiatric care for our patients. A man in his twenties has tried to commit suicide several times. He struggles with his humiliation and despair because of chronic urinary and faecal incontinence following torture in his country – he has nowhere to stay as he is always told to leave because he smells. We have provided him with his own tent and are seeking urgent transfer to Athens for further investigation and to improve his living conditions. Even for someone with his needs, it requires an enormous amount of time and effort from our social workers as well as intervention by our field coordinator and various other decision-makers to achieve this on a case-by-case basis. A family next to their small shelter in "Olive Grove". An Afghani woman tensed at every small noise and interruption while she told me of her constant nightmares, flashbacks and fearfulness since she was tortured and raped “a thousand times” in front of her child by multiple Taliban men who had entered her home. She had kept this from her husband along with her belief that their new baby was the consequence of her ordeal. She struggled to love this child and to take care of her other children, while her husband was doing the cooking and looking after all of them. She cried and shook as she spoke of how she relives what happened to her and how it is a constant part of her daily reality, making her frightened of everything around her and destroying her ability to consider herself as anything but worthless now. She told me repeatedly that her life was over and she wanted, all the time, to die. A Syrian woman makes no eye-contact and barely speaks (even on the fourth occasion that we meet with her), while her husband tells us that one of their children and other members of the family were killed by a bomb three years ago. She does not release her young son from her grip, even when he cries and squirms as he tries to get down from her lap. She clutches both of her children and grips onto her husband with her other hand when a light aircraft drones slowly above us. I considered that we were making progress because she allowed me to touch her hand briefly at the end of our last consultation. Most of our patients are diagnosed with depression and PTSD (post-traumatic stress disorder), with associated psychosis or dissociation. They often need a course of antipsychotic medication and close monitoring until they are able to engage with our psychologists. Rehabilitation is impossible while they are experiencing ongoing trauma and uncertainty about their future, so we aim instead for some degree of stabilisation and improvement in their everyday functioning. We try to create a safe environment for each patient and build a relationship of trust, so that we can focus on their strengths and coping mechanisms to enable them to endure the continuing hardship and stress in their lives. "We cannot refer psychotic or suicidal patients to the UNHCR as they insist that such people are stabilised first. Essentially, this means that those who would benefit the most are too mentally unwell to be moved out of Moria." These triggers can include the noise, seeing men in uniforms and witnessing regular violence (there are fights in the food lines and MSF’s other clinic just outside Moria deals with frequent cases of sexual assault. There has also been two riots between ethnic groups since I have been here), however, there is very little alternative accommodation available. We try to get patients relocated out of Moria camp, to improve their living conditions and to remove them from the many triggers that re-traumatise them. We cannot refer psychotic or suicidal patients to the UNHCR as they insist that such people are stabilised first. Essentially, this means that those who would benefit the most are too mentally unwell to be moved out of Moria. We will do what we can to help these patients, but we only see the tip of the iceberg – there is virtually no provision for so many whose poor mental health is disabling, but not extreme enough to meet the criteria. More and more children are being seen in MSF’s paediatric clinic here, with difficult behaviours, nightmares and bed-wetting. Their symptoms are rooted in their own traumas and losses, as well as their parents', and are worsened by the ongoing violence they continue to witness in the camp. A family from Deir Ez-Zor in Syria. They fled in 2017 after their neighbourhood was destroyed by barrel-bombs dropped by the Syrian government. But, again, there is no one to help. There is no access to a child psychiatrist or child psychologist on the island. Currently, people are coming mainly from Syria, Afghanistan and Iraq. And, with changing demographics, we are seeing many families: nearly half of the new arrivals are children. It is difficult to comprehend the logistics of processing and providing the basic needs of a never-ending influx of people, let alone the much wider needs of such a vulnerable and traumatised group. But it is not rocket science either, and it seems to be a vacuum of political will that sees this done so badly. My goal on a daily basis is not to be overwhelmed trying to help those who have such desperate past and present circumstances, who have multiple layers of trauma in their lives and who are just trying to find peace, dignity and hope for their and their family’s future. I am lucky to have a great team to work with. We will continue to struggle with the enormity of what should be, but is not, done for these people.